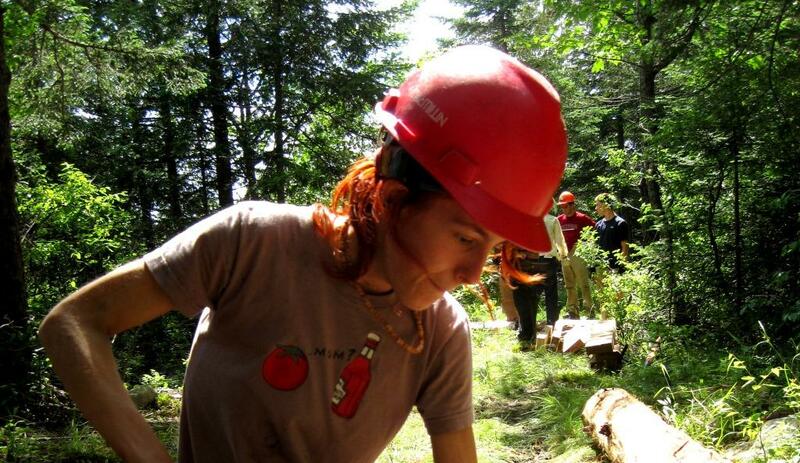 Coming to Maine, I wasn’t at all familiar with trail work, or even camping in general. Part of the reason I signed on with the AMC Teen Trail Volunteers was for an experience into the unknown; since coming from Florida made the wilderness a distant acquaintance. Little did I know the terms “pickmatic”, “hand me the loppahs”, and the Zen art of debarking until those 10 days that they would become the basis of my vocabulary. Those sweaty days in Maine would be filled with tests of my physical and mental abilities that taught something new about the forest with each challenge. 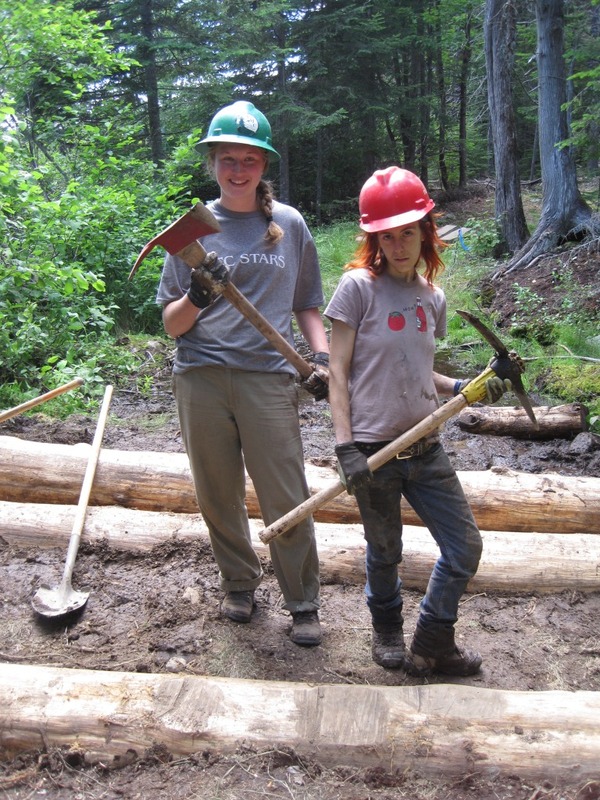 You see, our trail crew had the privilege of being guinea pigs as the first teen volunteers in Maine, an experiment that I found to be quite successful. What I received most from my labors during the day, and even my relaxed evenings at Camp Hodge was all that challenges can bestow upon you. I won’t sugar coat it- trail work is no confectionery. Black Flies, Deer Flies, and Moose Flies followed us like a walking beef wellingtons as we hauled 100 pounds worth of lumber toward our worksite where we installed an experimentally-constructed bog bridge. However, I’ve acquired a sense of satisfaction I’ve never gotten elsewhere (as well as some awesome forearm strength) because of our experiments. Trail work, and one instance where my crew helped hike-out an injured AT hiker from a trail in the 100-mile wilderness, required an alertness and awareness of the environment around us. Even if you’re a scraggly 5’2” art student like me, you not only get a physical test of your abilities, but an innate awakening as well. Every new experience I met had rich rewards which came in the form of skill-building, magnificent sights and sounds, and a tasty plate of food at the end of the day. 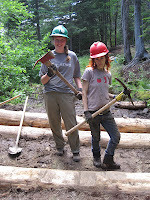 I can’t sum it up any other way except that I’m enamored by the wilderness and what trail crews have to offer. Confidence in what I can do myself and what I can do for others has increased exponentially because I was able to test it first-hand in the woods. I’ve been inspired by my crew leaders Beth and Leslie that strength, intelligence, and fantastic jokes can be rolled into a hardworking team. On top of that, I’ve got the sights of so many rocks and roots and the scenic beauty of our lakeside campsite always in my mind. Next year, I’ll be up to the challenge of another crew because I feel it will take me even farther as a trail worker and as a hiker. Until then, when I’m not in the woods, I’ll embrace each trial of my life with the vigor that I swing a polaski to preserve a trail.